I was recently archiving some old photos, when I came upon a favorite photo of my old cat, Celia. This isn't going to be one of those blog posts about getting over the death of a favorite pet, although I have to admit that when she died in 2000 of kidney failure, I thought I would never get over it, as Celia was indeed an amazing cat. Celia did wacky, unpredictable things, like hiding behind the washer/dryer in my Hoboken apartment basement, during one of my birthday parties! She also disappeared in a friend's suitcase once and almost experienced a flight from New York to Chicago, and she used to howl at squirrels and other creatures, with a sound so raw and primaeval, you'd have thought she was from the prehistoric ages. I fed her Fancy Feast until she blew up like a balloon, and then she was on a strict Science Diet regimen until she restored her shapely figure. She kept me company at night, curling up into a tidy black crescent in my bed. But this wasn't going to be a sad post about how I miss my cat. This is a post about the marketing legacy she left me. What happened was, my neighbor in Hoboken was a photographer, and asked one day if he could borrow Celia for some shots. I said "sure." Eight hours later, she was returned to me, spend and seemingly elated, like a model on her first fashion shoot. 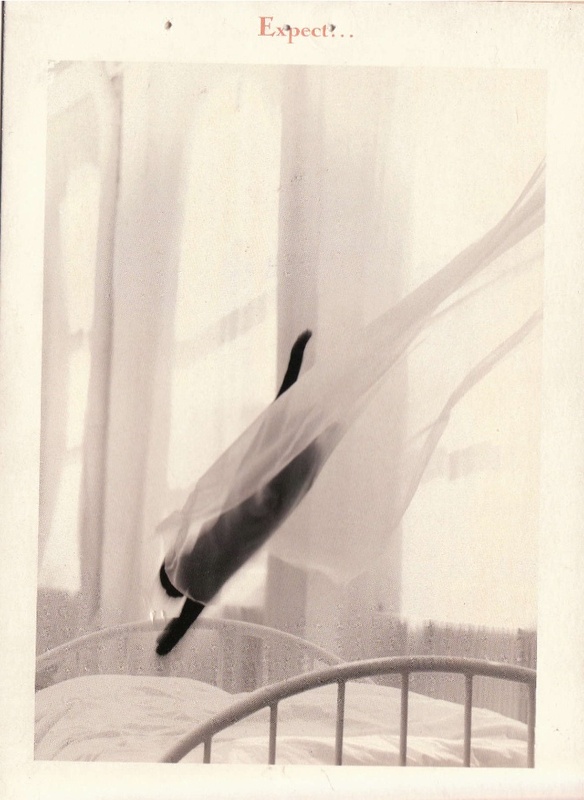 A week later, I was gifted with several prints from the afternoon's labors, the first of which you see here -- Celia flying through the air like a delicate feline ballerina. The series of photos produced from that day were amazing, and seemed to take on a life of their own, reappearing in photo books of cats, and as is the case in the photo here, notecards, that read "Expect," on the front panel, and "The Unexpected" on the inside panel. Even many years after her death, I kept running into Celia no matter what I did, in book stores, museum shops, stationary stores, everywhere. Celia was famous. Or rather, had had more then her 15 minutes of fame. It's true what they say, people (and animals, and just about anything else) are more interesting when they are moving. Hence, action shots are usually more exciting then stills, and photos and videos that show quick, forward momentum, are the ones that hold our attention. Another way to look at it: activity breeds activity. If you see yourself standing still, you will be. 2. Surprise with Black and White. Many bloggers and marketers use black and white very effectively in their posts and promotions. One of the reasons it is so effective is that people don't expect to see black and white. It's a great technique for when you want to be classy in the way you make your point, or if you have a high quality image that shows the contrasting elements perfectly. It can also be incorporated into video and I've seen it in movies, to show a departure or digressions from the storyline. I believe Woody Allen was notorious for this. Just take a look at Manhattan, for starters. 3. Have a Catchy and Minimalist Tagline. "Expect the Unexpected" is a perfect tagline for this photo series. It has a certain inevitability about it, which is a great litmus test for all slogans or marketing themes. If your business tagline or theme isn't resonating with you, it won't for anyone else either. Pick another one, and don't settle on anything until you've sat with it for at least a few days. Part of the success of this photo is the white curtain, that seems to form almost a veil around Celia as she jumps. Without the curtain, the photo would not be nearly as interesting. What are your accessories in business? Maybe they're your e-book covers, or the photos and graphics you use on your blog or website. Maybe they're the multimedia components you have to maximize your business presence. They could be as small as your logo, and as large as your media library or line of information products. Whatever they are, they must be so valuable that if they were to disappear for even one day, your audience would know it. Sometimes, a change in your surroundings is just what you need to get you unstuck from a tough project, or to get your creative juices flowing. I know I never would have seen Celia flying through the air like this in my apartment - it would never have happened. It took a change, and even a little staging, to get this effect, but it was so worth it. So for you? Change your setting. If you usually work at your desk, take a walk outside and bring your laptop to the park or a coffee shop. Take a notebook or your laptop with you on vacation, and be ready to jot down new thoughts and ideas that are bound to occur. Whether it's a big trip, or just a walk around the corner, you'll find it makes a huge difference in your creative output. So there you have it, 5 marketing lessons inspired by my dear cat, Celia. Now do you see why she was such a great cat? Now it's your turn. What other ideas does this photo give you? Have any of your pets inspired marketing ideas for you? Comment here and share. Love this. It's amazing what we can learn from animals. That picture is amazing. I would have loved to have been able to meet Celia. Thanks for your comment, Betty! So glad you enjoyed this, and I know Celia would have loved meeting you, and also would have loved hanging out with your great cats, who have made some marketing appearances of their own too! Having good marketing strategies shows your products in a different light, thus encouraging people to avail of it. Great point, thanks for your comment, Melissa! Constant change, thinking outside the box, and the element of surprise are marketing strategies that are undervalued and sometimes unexplored, yet (depending on how it's implemented) could bear fruit even better than what's expected. Thanks for your comment, Jonas, and yes it's so true sometimes there are indeed marketing surprises.